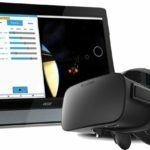 Vivid Vision is a Virtual Reality system used for Vision Therapy. It can be used for strabismus, amblyopia, convergence insufficiency and more. This involves 30 minute training sessions on a weekly basis for a minimum of 12 weeks to help improve the vision and the binocular vision abilities. Whilst wearing an Oculus Rift VR headset the patient is instructed in game play which is designed specifically to improve how the eyes see and work together.